Dubai’s retail sector added about 260,000 square metres of new space in 2016, the highest volume since 2010, according to consultants JLL. Its Year In Review 2016 report said Q4 saw the completion of about 20,000 square metres of retail space in the Dubai Festival City expansion while other notable completions throughout the year were phase 2 of The Avenue in City Walk and the Ibn Battuta Mall phase 2. It also said that retail sales in neighbouring Abu Dhabi are likely to remain under pressure in 2017 despite no major malls being scheduled for completion in the UAE capital this year. JLL added mall rents in Abu Dhabi are unlikely to change significantly over the next 12 months as new supply remains stagnant. 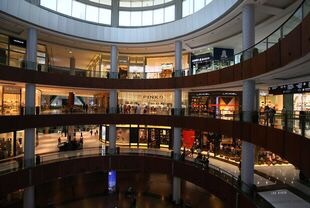 It said no major mall completions occurred in the UAE capital throughout 2016, with total stock remaining at about 2.6 million square metres. JLL added that approximately 85,000 square metres of retail space is scheduled for completion in 2017, mostly within residential communities or towers. Craig Plumb, head of research at JLL MENA, said: “Despite a number of retailers reporting a decline of sales during 2016, average retail rents remained unchanged in the primary malls of Dubai and Abu Dhabi. The JLL report also said that Dubai’s hotel market witnessed the completion of approximately 7,000 rooms in 2016, bringing the total hotel stock to 79,000 keys. About 14,000 keys are currently scheduled to be handed over in 2017, but these are unlikely to all materialise in time, it added. Abu Dhabi saw the introduction of about 1,000 hotel keys throughout 2016, bringing total hotel supply to 21,400 keys while another 2,000 hotel keys are expected to be handed over in 2017. JLL added that Abu Dhabi’s hospitality sector has suffered from a reduction in corporate demand, driven by the decline in oil prices, reduced government spending and corporate consolidation. This has, however, partly been offset by increased leisure demand, driven by the government’s major initiatives to diversify towards leisure tourism.